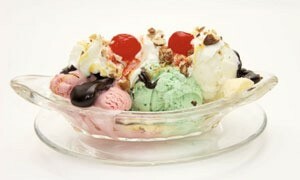 Most soda fountains served sodas, floats, sundaes, shakes and malts and the ever popular banana split. You can make them at home. This is a guide about old fashioned soda fountain treats. Close your eyes and come with me, a trip down memory lane to the place where red and white checked dreams come true. Many of us from the older generation can remember going to the local soda fountain for a burger and a shake or to have an egg cream or homemade French fries. Many were decorated with black and white floors and big old juke boxes where you could dance. For you youngsters, think "Happy Days". Many of the great recipes for our best frozen confections have been lost to us and, since I just love ice cream, it lead me to research many of the old fashioned treats of the past on the internet and in my travels. Just about every summer, we go to Oklahoma City to visit with my son and we travel on Old Route 66. When we get hungry, we stop for food at the revived Mom and Pop diners. I don't hesitate to ask for an ice cream confection recipe if they have something I have never seen before. With the advent of frozen yogurt, many of these can be made better for you by using it. Being a purist, I love using old fashioned ice cream. To complete your trip here are some terms you have not heard in ages, the language of your favorite soda jerk. Yes, they had their own language, calling out our orders as they made them. It was part of the fun, part of the atmosphere. Brings back great memories, doesn't it? In most soda fountains, ice cream was divided into 4 categories, sodas and floats, sundaes, shakes and malts and the ever popular banana split. Here are some recipes you can make at home to bring those memories back and to relive with your kids. For frosted glasses, rinse in HOT water and place in freezer for 1/2 an hour. Despite the name, egg cremes are not made with either egg or cream. Some of the recipes do call for raw egg, which we now know can be dangerous. If you clean the eggs with bleach, you can minimize your risk. Make these at your own risk. Cherry Coke: Into a glass filled with ice, pour 3/4 oz. of cherry syrup. Fill the glass with Coca Cola. It will take you right back to your childhood! Bronx Egg Creme: 2 tablespoons chocolate syrup, 5 ounces milk, 3 ounces seltzer water. Mix the chocolate syrup and milk together. While stirring, add the seltzer and continue stirring. Black And White: chocolate syrup, seltzer, vanilla ice cream. Chocolate Soda: 3 Tbsp. chocolate syrup, 1 Tbsp. 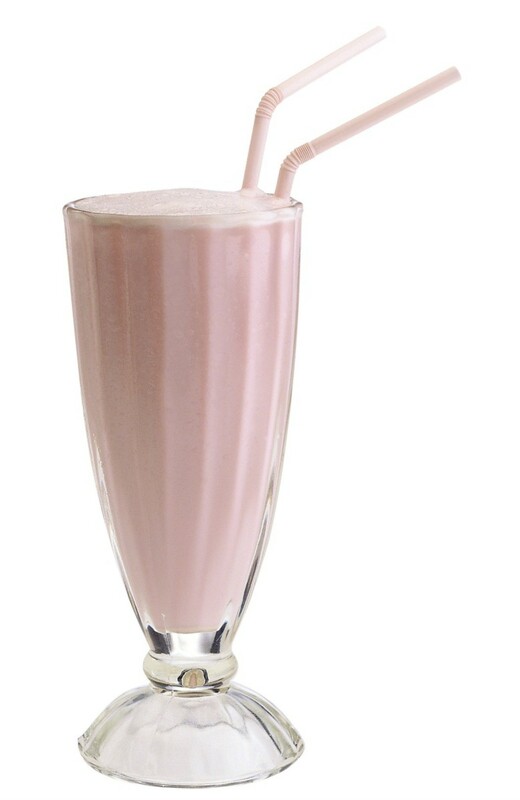 milk, 1 scoop ice cream (chocolate, vanilla, or other) soda water (carbonated water - not club soda) - Put the syrup and the milk into the glass. Stir well. Add the ice cream. Fill the glass with soda water. Stir again. Catawba Flip: 1 scoop vanilla ice cream, 1 large egg, 2 oz. grape juice shaved ice, seltzer - Put all the ingredients in a blender, except the seltzer, and blend until smooth. Pour into the glass and fill with seltzer water. Caramel Egg Cream: Into an iced filled glass, pour 1 1/2 oz. caramel syrup. Add 4 oz. a"cold" milk and stir. Add ice. Fill with seltzer (seltzer has no sodium), leaving 1/2 inch of space at the top of the glass. Top with 1/2 oz. vanilla syrup. Stir again. The Apple Blossom: 1 1/2 oz. apple syrup; 1 tablespoon whipped cream or ice cream or 1 1/2 oz. coffee cream and 2 dippers of vanilla ice cream are added to a soda glass. Add carbonated water 3/4 full. Garnish with a spoon of whipped cream and a slice of fresh apple. The California: 3/4 oz Pineapple syrup; 3/4 oz orange syrup; 1 tablespoon ice cream or whipped cream and 1 dipper each of orange sherbet and vanilla ice cream are placed in a soda glass. Add carbonated water 3/4ths full and garnish with whipped cream and a half slice of fresh orange. Black Raspberry Passion: 3/4 cup sparkling water, 1/2 cup raspberry juice, 2 tablespoons almond flavored syrup, 1/2 cup frozen blackberries, 1 cup raspberry sorbet - In blender container, combine all ingredients; blend at high speed until smooth. Serve immediately. 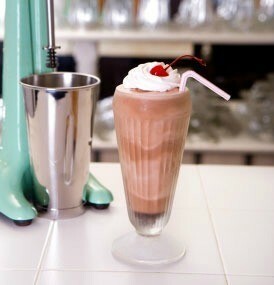 Next week: Shakes and Malts. Future weeks will cover sundaes and homemade toppings. 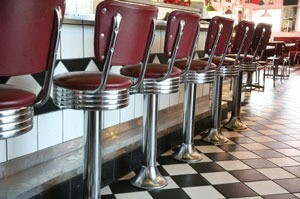 Editor's Note: What is your favorite soda fountain memory? Vanilla Milk Shake (White Cow): 4 scoops vanilla ice cream, 1 Tbsp. vanilla extract, 1 1/2 cups milk. Put into a blender container and blend until smooth. There is nothing better in the world than homemade toppings for ice cream. You can make so many more flavors than you can buy at the grocery store. Well, here we are with part three of our "walk down Memory Lane". I sure hope you enjoy these recipes as much as I did. 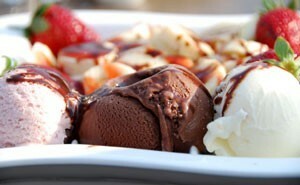 The basic construction of a sundae is ice cream in the bottom with a topping and garnishes on top. 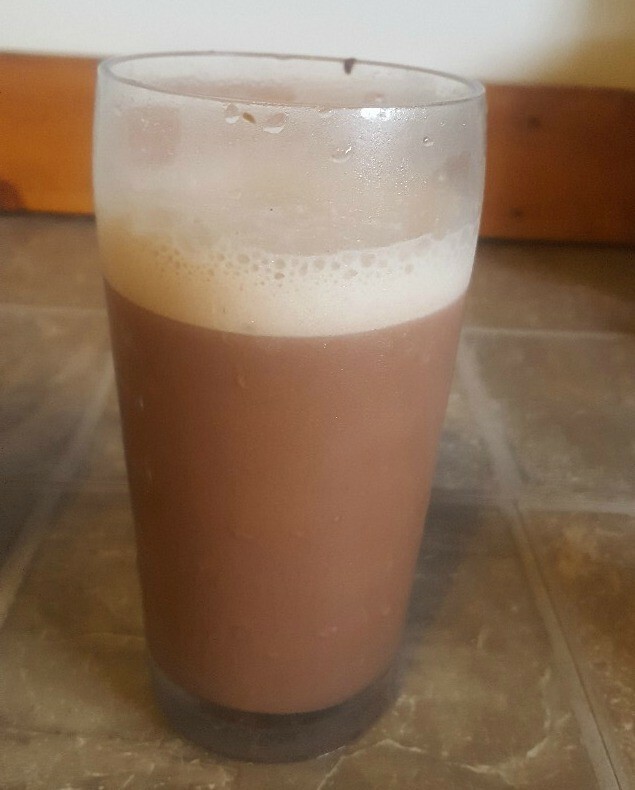 This guide contains a healthy egg cream soda recipe. Enjoy the rich flavor you might find at an old fashioned soda fountain.